Learn all about bicycles at Asia’s first bicycle design school! Tokyo College of Cycle Design is the first Japanese government authorized college, opening in April 2012 at Tokyo Shibuya. The curriculum, from basic product design skill to frame building and maintenance techniques, will lead all students for the "Bicycle Creators" of new generation in two or three years program. You can challenge everything of bikes with us! Tokyo College of Cycle Design (TCD) is Japan’s first (and Asia’s only) authorized college that focuses on bicycle education. The college allows students to learn all about bicycles—which is attracting the attention of the world as an environmentally friendly means of transportation—and develops individuals who will lead the bicycle industry in the future. Attractive lessons are given by first-class lecturers, including Mr. Shin-ichi Konno, owner of the hand-made bicycle brand Cherubim, which is highly rated both in Japan and throughout the world. TCD students can obtain a student visa valid for up to two years and three months. The Foreign Student Center offers advice to foreign students concerning their residence status in Japan, helps them obtain the proper residence status, and provides support for their lives in Japan. Throughout the year, TCD offers various programs to support students’ academic or career choices, such as career counseling and seminars for job seekers. In addition, full-time career counselors provide complete assistance so that each and every student can choose a career most suitable to them, whether they wish to seek employment or further study abroad. 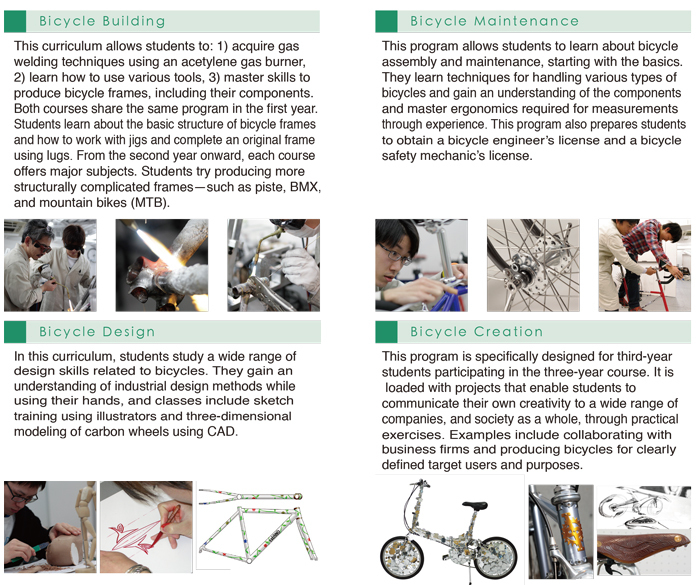 This course aims students to become professional bicycle experts in designing, maintenance, frame building, and all related bicycle business fields. Besides two years program, this course offers more creative process of new bicycles with industry or social activities, even referring to the new lifestyle of bicycles and society.